Design Within Reach sponsored this contest where five students from the Parson’s School of Design were challenged to create skins for Geneva Sound stereo using Gela Skins. The results turn these amazingly versatile audio devices into playful works of art. Although there are some who claim the Geneva’s are museum worthy in their unadorned state, I’d take one of these gussied up versions in a hot second. Vote before midnight on your favorite design and get a chance to win your very own $799 combination speaker, radio, clock and iPod dock. Love the bacon bandages. Thanks Nick! You can buy these, and other fun bacon themed accessories here…..
Back problems and painkillers have me pretty much living on the couch these days. Too much TV may rot the brain but frankly it’s the volume fluctuations that have mine scrambled. The differences in volume from channel to channel. The switching between Bad Boys II (for the 400th time) and The Gilmore Girls. Quite a shock to go from the quiet, witty banter of the latter to the explosions of the former. And don’t even start with the commercials. These types of volume discrepencies are pretty common complaints, so it was a shock to find just two products on the market that promise a fix. The VR1 TV Volume Regulator and the Automatic TV Sound Regulator. Both have been available for quite a while. In the case of the former (under the Terk or now Audiovox name) years actually. Just hook the box to the TV and signal source and it regulates the modulations in volume, making commercials a little less offensive. Now if only it muted screaming studio audiences, I might actually watch Oprah. This is so wrong it’s right. And while it doesn’t get more low-tech than matzo, what with hailing from the days of Moses and Pharoh but in the spirit of the holiday, why is this post different from all other posts? I’ve been knocked out by a back issue and am struck by the relationships between technology, a healthy back and a well lived life. There are more places where these things intersect than I had imagined. Of course there’s the obvious items like a good work chair. Mine is not good, nor stylish, both of which irk me to no end. If I had my choice, I’d spring for the newest, priciest item from Herman Miller. It’s $1,600, sigh. But even the typically dripping in sarcasm Gizmodo reviewers couldn’t say enough good things about it. 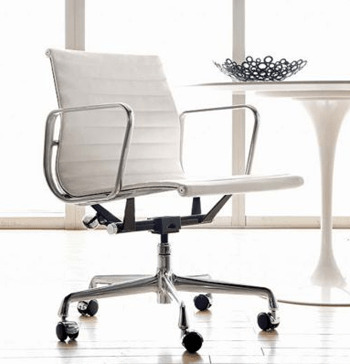 It’s actually replaced the Eames Aluminum Group Management Chair in white leather as my chair crush of the moment. Just a smidgen less expensive at around $1,200. Still, it’s a bit out of reach. There’s always the McKenzie lumbar roll at $30. Not so glamorous but neither is laying on the couch, moaning in pain for weeks on end…. Or maybe just a long weekend. This is Bacon Camp. 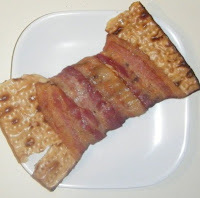 It’s a blog but also, an actual event Where folks swap recipes and tales of bacon love. People have been sending me all sorts of bacon links and it’s great to see how much we share the a fascination for all things bacon. Thanks to Nick Brown for this. 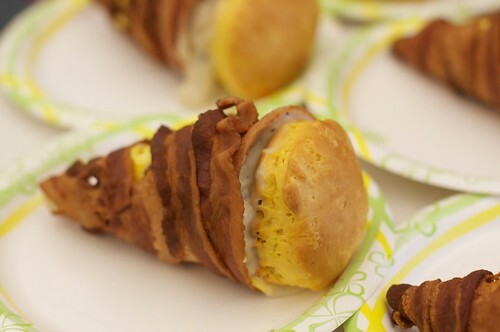 I just wish I had come up with the Bacone recipe. That pig trophy is sweet.